Filmed on the virtually deserted Setonaikai archipelago in south-west Japan, The Naked Island [Hadaka no shima] was made – in the words of its director – "as a 'cinematic poem' to try and capture the life of human beings struggling like ants against the forces of nature". Kaneto Shindô (Onibaba, Kuroneko) made the film with his own production company, Kindaï Eiga Kyôkai, who were facing financial ruin at the time. Using one-tenth of the average budget, Shindô took one last impassioned risk to make this film. With his small crew, they relocated to an inn on the island of Mihari where, for two months in early 1960, they would make what they considered to be their last film. The Naked Island tells the story of a small family unit and their subsistence as the only inhabitants of an arid, sun-baked island. Daily chores, captured as a series of cyclical events, result in a hypnotising, moving, and beautiful film harkening back to the silent era. With hardly any dialogue, Shindô combines the stark 'Scope cinematography of Kiyoshi Kuroda with the memorable score of his constant collaborator Hikaru Hayashi, to make a unique cinematic document. Shindô, who had worked with both Kenji Mizoguchi and Kon Ichikawa, shot to international fame in 1952 with the astounding Children of Hiroshima. Eight years later, the BAFTA-nominated The Naked Island won the Grand Prix at the Moscow International Film Festival (where Luchino Visconti was a jury member). It is now considered to be one of Shindô’s major works, and its success saved his film company from bankruptcy. 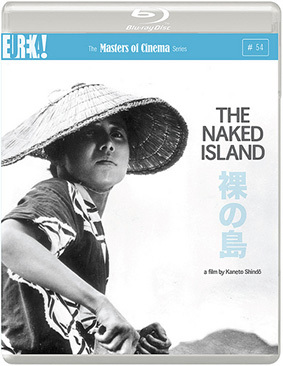 The Naked Island will be released for the first time on Blu-ray in the UK by Eureka as part of the Masters of Cinema series on 17th June 2013 at the RRP of £19.99. You can read our review of the Masters of Cinema DVD release here.